Theatre can get a bad rep for being stuffy, but Skeleton Crew playwright Dominique Morisseau is shaking things up with her Rules of Engagement. After a less-than-pleasant interaction with a fellow audience member at a play she helped develop, Dominique channelled her frustration into positive action for the Off-Broadway run of her play Pipeline. She came up with a list of guidelines to help every theatergoer—not just “theatre people”—feel at home in the theatre. These “Rules of Engagement” encourage audience interaction with the show: laughing, clapping, even an “amen” or “uh huh” wouldn’t be out of place when big ideas are dropped on stage. Dominique wants the audience to engage with the actors to help create a new kind of theatre experience for the actors and the audience. If you were lucky enough to catch Kane Smego’s Temples of Lung and Air last month, this idea will be familiar to you. Kane introduced our audiences to this extra interaction during his performance and it changed the energy of the entire show. Kane told the audience to snap, clap, or make “grandma’s cookies noises” in response to what they were seeing on stage. As the audience joined Kane in telling the story, the whole room came alive and it created a completely new theatre-going experience. The audience became a community united by the common experience. Going to the theatre for a show is always communal event. A big group of people come share not only the same space, but to exchange energy. The actors give and take from the audience and each other, and the audience does the same. Storytelling that is in every way present fills the room with a new kind of energy, turning a piece of drama into something more. So what will you do? When you come see Dominique Morisseau’s Skeleton Crew, will you sit back in your chair a let a story be told at you? Or will you lean in, engage, and allow yourself to be a part of the storytelling process itself? Step up to the line in Skeleton Crew, on stage at PlayMakers Oct 10–28. Click here to buy your tickets today, or call 919.962.7529. You are allowed to laugh audibly. You are allowed to have audible moments of reaction and response. My work requires a few “um hmms” and “uhn uhnns” should you need to use them. Just maybe in moderation. Only when you really need to vocalize. This can be church for some of us, and testifying is allowed. This is also live theatre and the actors need you to engage with them, not distract them or thwart their performance. 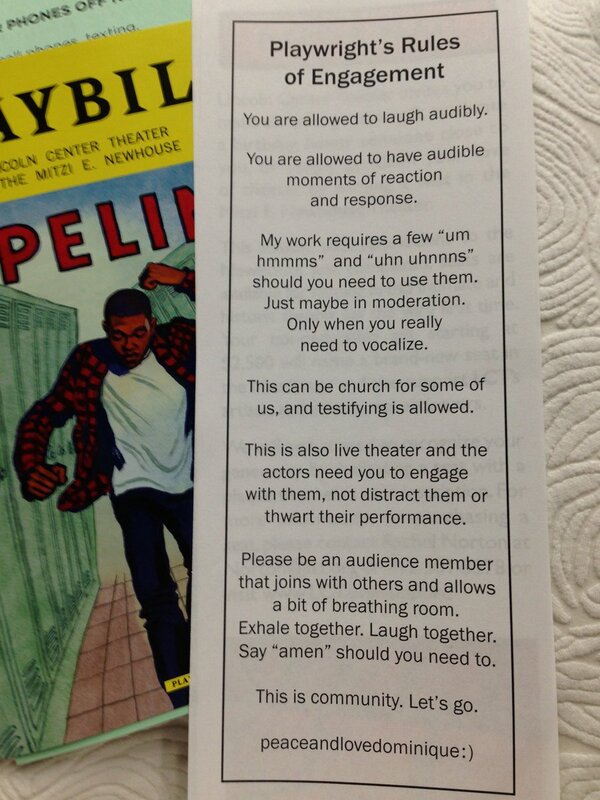 Please be an audience member that joins with others and allows a bit of breathing room. Exhale together. Laugh together. Say “amen” should you need to. This is community. Let’s go.